plastic gear pump manufacturer/supplier, China plastic gear pump manufacturer & factory list, find qualified Chinese plastic gear pump manufacturers, suppliers.Pump products from large database of plastic gear pump manufacturers and supplier.gear pump, valve, micro-small-displacement pump, glue pump, plastic pump. 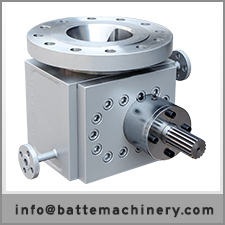 Zhengzhou batte plastic gear pump is mainly used for high temperature and high viscosity polymer melt conveying, pressure, measurement.Batte Machinery Zhengzhou Co.,Ltd. is a professional manufacturer of Melt pumps,Loss-in-weight Feeder,Screen changer. The main products are Melt pump,Loss-in-weight Feeder,Screen changer and gear pumps ,metering pumps,Batte has accumulated abundant experience on the application technique of melt pumps since we manufacture pumps professionally. Recently according to the development trend of melt pumps application all over the world, especially in the field of precise plastic extrusion, we have done extensive research on the pump operation performance, practical function, equipment structure and control technology and achieved regular achievements.